Practical areas such as laundry rooms rarely get the attention they deserve. But a laundry room is one of the easiest places to update because of its small size. What’s more, you can transform the room without buying new appliances. Brighten up your laundry room and enhance its efficiency with these laundry room decor tips. Painting your laundry room walls can instantly transform the space. You can make the room look bigger by using light colors or make it cozy with bold colors. Bright paint can go a long way towards helping you to enjoy your chores. Paint the trim a different color to give the room a finished look. You can also add character to the space with murals, posters, decals, and fun signs. As you give your laundry room a makeover, remember that storage is one of the most vital things. Increase storage by adding laundry room cabinets and shelves which can hold hangers, irons, sewing kits, detergents, and clothespins. The extra space can hold seasonal items and pet accessories. Make your laundry room a functional place where chores are tackled at once. DIY Network has some creative laundry room storage ideas. Sometimes, you need a little inspiration in order to be more creative. Browse laundry room makeover ideas and you will boost the style and efficiency of the space. For instance, you can add a folding station to minimize wrinkles in clothes, integrate an ironing board to handle simple touch ups, or store all your detergents in a lazy Susan. 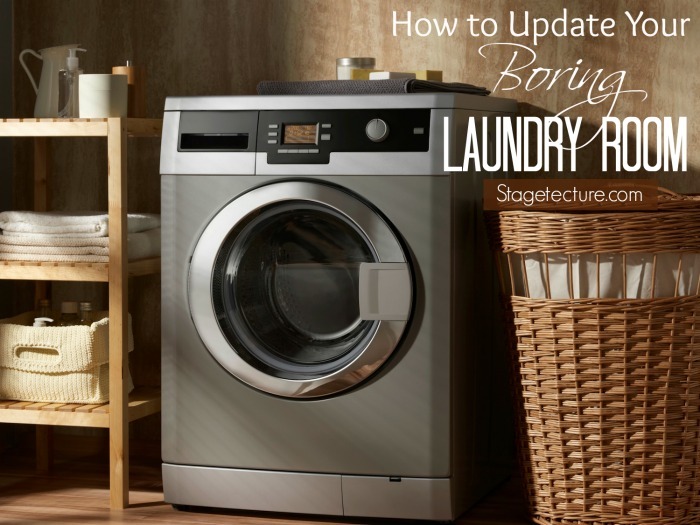 After updating your laundry room, don’t stop there. Carry out regular laundry room organization to ensure it stays in tip-top condition. Keep your cleaning supplies in one place. You can store them in an open-top storage container or a carry-all caddy. If your pet has a lot of toys, designate a spot for them to free up space. Put dirty clothes in hampers to ensure they are not scattered in the room and place lost and found items in a container. An organized laundry room is a cleanup command center. Whether your laundry room sits next to the kitchen or in a corner, take time to update it. Make it as clean and as organized as the other rooms in your home with these laundry room decor tips. Here are Better Home’s & Gardens’ best tips on updating a laundry room. For more Laundry Room ideas on Stagetecture, look at our Laundry Room category here.